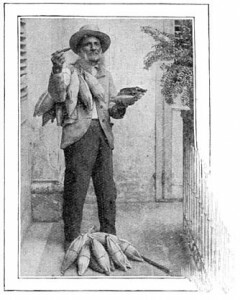 These photos capture a Cuba that does not exist anymore; a Cuba caught between its Spanish colonial heritage and the beginning of the 20th century. 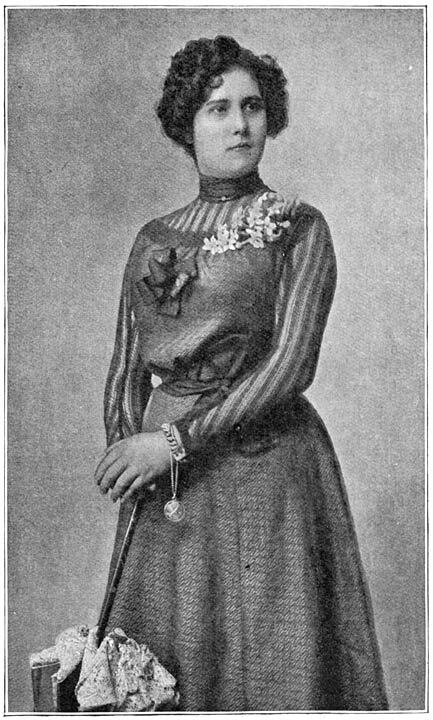 The photographs were taken by Charles Berchon, a Frenchman who wrote a book called “Six Months in Cuba” published in 1908. 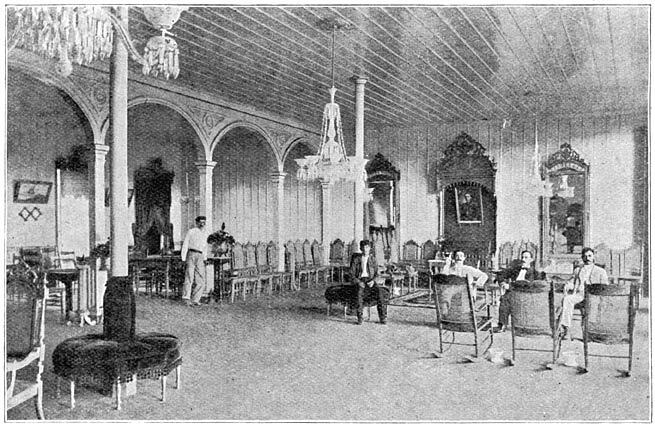 The interior of a Cuban home belonging to well-to-do people. 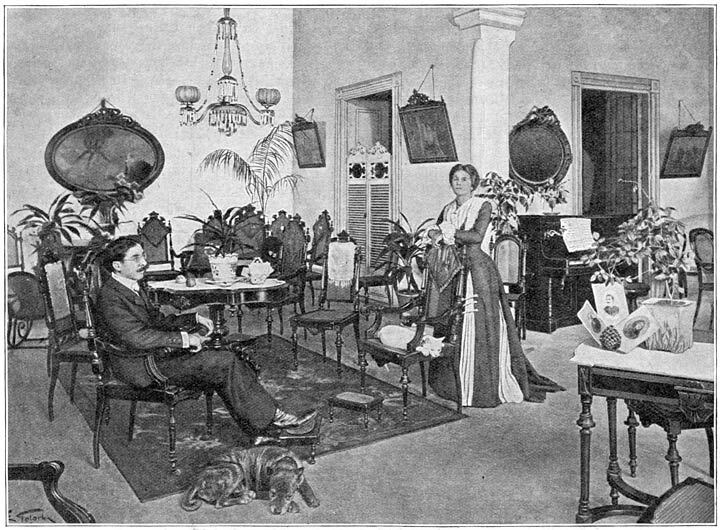 In this picture we are given a glimpse into the sitting room of a Havana home which clearly belongs to some well-to-do Cubans, likely belonging to the cultural and political elite that proudly traced its pedigree to Spain. One of the things that I find interesting about this picture is the way the house is decorated. 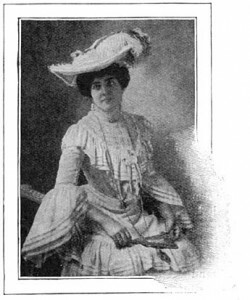 Notice that the paintings or wall hangings are angled about 45 degrees away from the wall. Also interesting are the foot rests. In contrast to the genteel comfort of this house, are the following pictures which depict what life was like for persons of the lower classes. 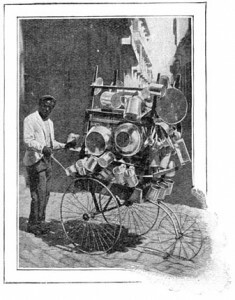 This picture depicts a traveling street salesman. His entire stock of goods consisting of various pots and pans is balanced ingeniously on a hand-pushed cart. 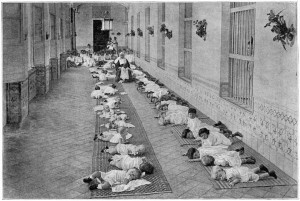 In this picture we see a large number of foundling and orphan children at a Havana hospital. Most institutions like these were funded by private donations rather than public funds. Children are laid out like cord wood in a Havana hospital. Did they use any sort of ID bracelets to keep them straight? A private Havana club. Its members enjoy a good cigar. Enjoying a cigar at an exclusive Havana social club. As now, the production of tobacco and cigars was a mainstay of the Cuban economy. 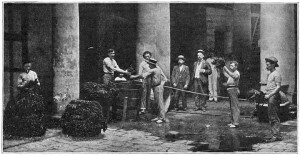 In the picture below workers are seen preparing bales of tobacco by moistening it. In this photograph you can see some of the workers who rolled the cigars. 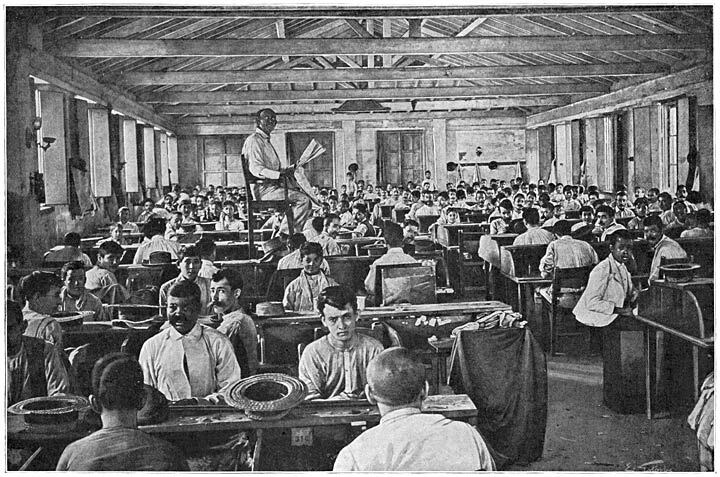 Then as now, it was a labor intensive process that required each cigar to be rolled by hand. What I find interesting about this picture is how the manager or foreman is seated on a raised seat from which vantage point he can survey the entire shop floor. One can imagine the kind of dictatorial management style that must have been employed. 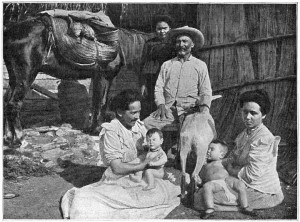 In this picture a Cuban farm family is depicted. 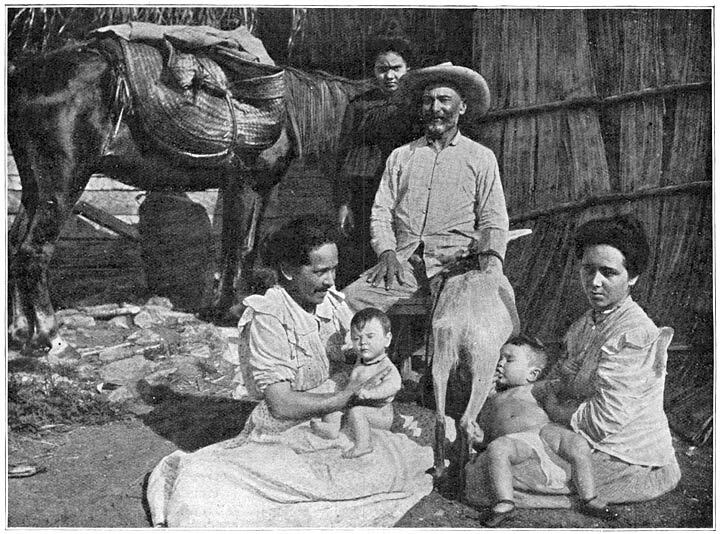 Not the baby on the right of the picture: he appears to be suckling milk directly from the family goat’s teat. And so now we have reached the end of our six month’s stay in Cuba and we must say goodbye forever to the Cuba of 1908.